How Much Plasma Does It Take To Reverse Warfarin? For decades, plasma (with vitamin K) was the mainstay for reversing warfarin. Over the past several years, prothrombin complex concentrates (PCC) have made inroads in the management of this problem because of its sheer speed of action. There are two problems with plasma. First, most hospitals still have only fresh frozen plasma (FFP), and it takes 20-30 minutes to thaw. This adds some up-front time to administration. Then, it takes time to infuse the 250cc or so of volume in each unit. This may be 1 or 2 hours, depending on policy and patient tolerance of a bolus of colloid. If it always just took one unit of plasma to correct the INR to a desirable range (typically 1.5-1.6), then the whole PCC conversation might be moot. You could potentially have the INR corrected in 30-60 minutes depending on your patient’s cardiovascular system. But how many does it really take? A group at Eastern Virginia Medical School in Norfolk, VA looked at this problem and tried to come up with a mathematical formula. They examined a year of warfarin reversal data at their hospital. Patients with severe clotting disturbances (advanced cirrhosis, DIC) and those who received additional products (PCC or activated Factor VII) were excluded. So a patient with an INR of 3.0 would be expected to show a decrease of 0.99 to about 2.0 after one unit. This formula can be used iteratively to figure out how many units will drop the INR to the goal range. Bottom line: This is a nice little piece of information to tuck into your pocket or phone. For patients inside the usual therapeutic values, it will take 2-3 units of plasma to reverse. For your average older human with average comorbidities, expect this to take 4-6 hours, not counting ordering, thawing, and delivery. If my definitions of “life-threatening bleeding” are met (see below), your patient may have significant adverse events during this time frame. So think very seriously about using PCC instead. 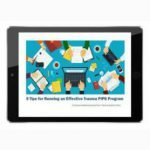 What’s the INR of FFP? 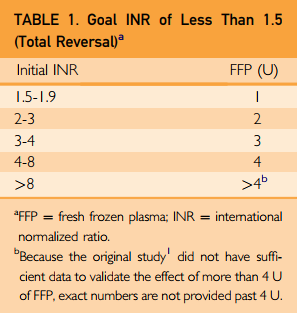 Reference: Fresh Frozen Plasma Dosing for Warfarin Reversal: A Practical Formula. Mayo Clin Proc 88(3):244-250, 2013. Yesterday I published a protocol that Regions Hospital uses for rapid reversal of warfarin in patients with life-threatening bleeding. This is very useful in trauma patients, but a number of other specialties use it as well (GI, etc). But what about that patient who doesn’t have a major bleeding problem, but needs emergency surgery or some invasive procedure? If something isn’t done prior to the case, the surgeon or interventionalist may inflict life-threatening bleeding! Is the patient in DIC? Do they have heparin induced thrombocytopenia (HIT)? Do they have a history of significant peripheral vascular disease or thrombotic tendencies? Will they need to be re-anticoagulated afterwards? Again, feel free to download this protocol and modify it as you wish. Comments and questions are welcome! I’ve previously written about reversing specific agents that may interfere with clotting in trauma patients. Today I’m going to provide a reference sheet to help you reverse any of the common agents that your trauma patients may be taking. This reference is a work in progress and will change as new drugs are introduced. I’ll update it as revisions are made. And as always, comments and suggestions are welcome! Click here to download the reference sheet. In May, I wrote about a new direct thrombin inhibitor named dabigatran (Pradaxa). This drug appears beneficial for patients who need ongoing anticoagulation without the hassle of blood testing to check drug levels. 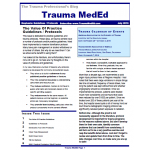 The danger for trauma patients is that there is no antidote or rapid reversal possible. This means that significant traumatic bleeding, particularly in and around the brain, cannot be stopped! At Regions Hospital, we have seen a few patients on this drug, but luckily they have not had bleeding from trauma. Late last month, Bristol-Myers Squibb and Pfizer announced that a new drug has shown very favorable results in preventing strokes in patients with atrial fibrillation (apixaban, Eliquis). Indeed, it cut the relatively low risk of stroke in half, compared to warfarin. It also had about a third fewer bleeding complications. It looks like it may also give dabigatran a run for its money. This drug is a Factor Xa inhibitor, and also has no antidote other than time. There is some evidence that activated charcoal given orally within 3 hours of apixaban dosing may be somewhat helpful in reducing blood concentrations. Trauma professionals need to be on the lookout for patients who use this drug. Any trauma patient who admits to being on a “blood thinner” needs to be questioned carefully to determine which one it is. If it is one of the newer drugs without an antidote, they need to be monitored continuously for signs of bleeding (read: ICU), especially if they have experienced head trauma. Bottom line: Be on the lookout for these drugs. If any patients who have fallen are taking this drug (elderly, frequently intoxicated, etc. ), contact their primary physician so that the risks vs benefits of continuing it can be considered. First, there was warfarin, a cheap and effective way of treating deep venous thrombosis (DVT) and pulmonary embolism (PE) in trauma patients. 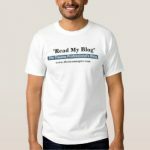 Unfortunately, there is plenty of literature that shows the added risk that this drug poses in injured patients, particularly in head injury. Because of this, many trauma centers have developed “rapid reversal protocols” to quickly restore vitamin K dependent clotting factors in an attempt to improve outcomes. To see our protocol, click here. Next came clopidogrel (Plavix), which is used to prevent clotting in vascular disease. It irreversibly inhibits platelet aggregation. Counteracting this drug is more complicated due to its long half-life. Platelet infusions are required, but the infused platelets are inhibited by any remaining drug in the plasma. This requires the use of lots of platelets to get some meaningful clot to form again. Now, we have direct thrombin inhibitors (DTI). Hirudins were the first used, and were never an issue in trauma patients. And their short half-lives obviate the need for reversal. The newest DTIs (argatroban and dabigatran) are a real problem in trauma. Argatroban is not a problem, because it is given by IV only. But dabigatran (Pradaxa) has just been approved for oral use within the last year. We will be seeing patients taking this drug in the near future. What do we do if they are trauma victims with bleeding in critical places, like the brain? At Regions, we have developed a proposed guideline that combines oral charcoal, dialysis, transfusions and optionally, activated Factor VII. Click here to download the protocol. If anyone has any experience with these patients, please comment below. And everyone else, keep your fingers crossed!